1. CBRE arranged $22.8M in debt financing for the recent acquisition of Missouri Falls, a class A office building in Phoenix. The property is 87 percent leased. Dana Summers, Bruce Francis, Shaun Moothart, Bob Ybarra and Doug Birrell of CBRE’s Debt and Structured Finance team arranged the 10-year full-term interest only loan for the buyer, El Dorado Holdings, Inc., which purchased the property for $41.4M. 2. The 261-room Gainey Suites Hotel in Scottsdale was sold by Gainey Hotel Co. LLC to Hospitality Properties Trust for $36M in October, according to Maricopa County records. The hotel has been rebranded as Sonesta Suites Scottsdale Gainey Ranch. 3. FAE Holdings 490296R, LLC, successfully bid $25.8M for a 51-acre parcel of State Trust Land west of 40thStreet and south of Loop 202, Arizona State Land Commissioner Lisa A. Atkins said. The subject parcel, zoned by the City of Phoenix for Commerce Park/General Commerce Park, was appraised at $14M, which was the auction’s minimum bid. 4. Ascentris, on behalf of one of its public retirement system clients, announced the purchase of Kierland Corporate Center II, a three-story, 82KSF, 93 percent-occupied Class A multi-tenant office property. The property, 7033 E. Greenway Parkway in Scottsdale, was sold by PCPI Kierland II LLC and Parallel Capital Partners for $25M. Eric Wichterman and Mike Coover of Cushman & Wakefield Phoenix brokered both sides of the deal. Colton Trauter and Bill Blake from Lee & Associates will lease the property for Ascentris, and Arcadia will provide property management services. 5. The 152-unit Paseo Del Sol Apartments, 6280 South Campbell Avenue, Tucson, sold this month for $12.500M. The NorthMarq Multifamily team of Bill Hahn, Trevor Koskovich, and Jesse Hudson represented both the seller and the buyer. AndMark Paseo del Sol Apartments, LLC was the buyer. 6. Catalina Village Apartments, a 152-unit complex at 225 W. Catalina Drive, Yuma, has been sold. It will now be called The Palms Yuma. Ryan Sarbinoff, of Marcus & Millichap, said the complex sold for almost $9.7M. The buyer, Corey Peterson, is a managing member for Kahuna Investments. 7. Stonebriar Commercial Finance Realty Capital, dba SCF RC Funding IV LLC, purchased the property at 3920 E Grant Road in Tucson for $4.2M. The nearly 51KSF former Fry’s store and gas pad on 4.96 acres had been closed for about a year and will be redeveloped for a VASA Fitness Center. The property was sold by Smith’s Food and Drug Centers, Inc. Tyson Switzenberg of JLL represented the seller. 8. CBRE negotiated the sale of a 10KSF multi-tenant retail building located at Coldwater Plaza in Avondale for $2.89M. George Boukather acquired the property, 1461 N. Dysart Rd., from Sparty Holdings, LLC. CBRE’s Steve Julius, Jesse Goldsmith and Joe Compagno represented the seller. 9. Holliday Fenoglio Fowler, L.P. announced the sale of Red Mountain Corporate Center, a 132KSF office building in Phoenix. The HFF team represented the seller, an institutional investor, and procured the buyer, Alidade Red Mountain, LLC. 10. 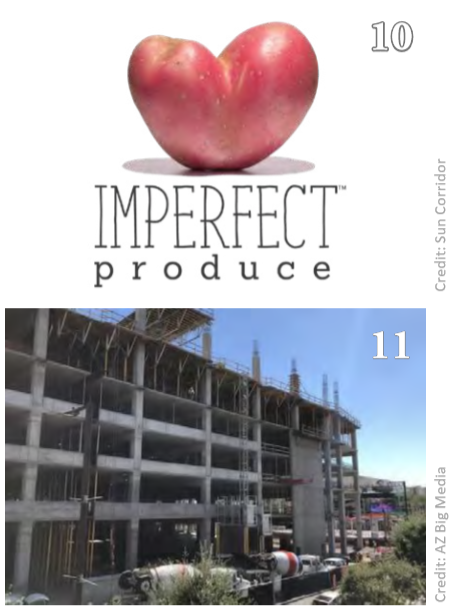 Produce delivery company Imperfect announced plans to open its first customer care center in Tucson. The company has leased 24KSF of office space at 3535 East Valencia Road and is expected to begin operations in early 2019. Key project partners include Arizona Commerce Authority, Pima County, City of Tucson, Visit Tucson, University of Arizona, Cushman & Wakefield/PICOR and Sun Corridor Inc.
11. RED Development announced its first office tenant at the downtown Phoenix Block 23 development. Ernst & Young U.S. LLP plans to open a 20KSF office there in late 2019.